Romance is a varied and fluid literary genre, notoriously difficult to define. This groundbreaking Companion surveys the many permutations of romance throughout the ages. 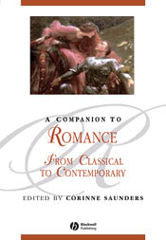 Considers the literary and historical development of the romance genre from its classical origins to the present day Incorporates discussion of the changing readership of romance and of romance's special relation to women readers. Comprises essays written by leading authorities on different periods and sub-genres. Challenges the idea that the appeal of romance is exclusively escapist. Draws on a wide range of specific and influential literary examples.